'Jane Got A Gun' was one of the films that looked to be stuck in developmental hell when it was first reported to be made into a feature length film based on screenwriter Brian Duffield's screenplay. The film had many names reported to have been attached to the project with big names like Jude Law and Michael Fassbender apparently being set to star. Finally though, it was one of the films that was lucky enough to finally escape from the clutches of only being considered to actually be brought to life. The title alone leads to a lot of interest as it teases the possibility of a strong female character who can cut it with the men within a western. It sets up a story that could be truly brilliant and create another strong female character that has had a resurgence in recent years. However within 'Jane Got A Gun', it is not what you would want from this character especially. Jane (Natalie Portman) has a gun but she doesn't really do much with it in all honesty. In a film where the creation of a strong female character and also into a western was huge possibility, they instead went on the route to make her over reliant on the help from men in her life. This is even more so the truth in the abundance of flashbacks that we see throughout the film. In these flashbacks we see events within Jane's life and in particular moments when she is in trouble. Now these opportunities could've been useful to make Jane a feared outlaw, however she is mainly the damsel in distress who requires saving rather than being able to do so herself. There's only a handful of moments where she has the opportunity herself to strike but that is only due to distraction or that her target was powerless and couldn't defend himself. It does show that she has some sort of ruthless streak but we don't get enough of it for our satisfaction. Back to speaking about the flashbacks and the film really is carried by them. You don't have to wait long for one of these flashbacks that are filled with exposition. The majority of information we find out about our characters comes from these exposition filled flashbacks. At times, these feel drawn out and could take up much less time. However that may be true, there are some interesting points in the stories as we learn about Jane and her now ex husband Dan Frost (Joel Edgerton). We see the complicated tale of their relationship and now they were taken apart as well as both of their journeys to find each other once again. Through this, Edgerton really shines and shows his acting capabilities more so than anyone else in the film. His toughness and calmness when in the face of danger but also showed emotion in one of the films biggest revelations. Ewan McGregor does alright as the main villain but the film doesn't really give his character that much to do. Due to this, we do not see his sinister ways or see a reason to really fear him. The story doesn't give his character the opportunity to show his ruthless ways, all we get really is some wanted posters. This Western also does a great job with many of its standoffs which have great dialogue within them. Although the outcomes are pretty predictable, the scenes do have tension and do well to keep your attention. As a iconic feature within the Western genre, the scenes within JGAG do it justice and keeps it fresh. The finale of the film is pretty fun but also equally ridiculous as an inferno consumes many victims in the first stage of the final showdown. This in the setup looked to be pretty clever and looked forward to it coming into play. However when it comes into tuition, there's no doubting it is pretty ridiculous. The finale is also underwhelming as we expect the cavalry to really come in and have all guns blazing. However it is just every one hiding from each other and guessing where to shoot and hoping it hits a target. The film most definitely had a lot of promise but unfortunately misfires in a lot of ways. Some fine performances and visually appealing but doesn't hit the mark like it could of done. 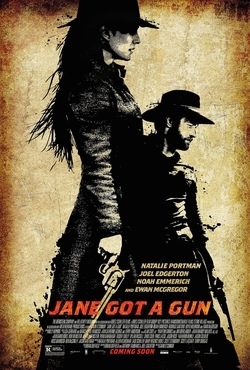 So have you seen 'Jane Got A Gun' and if so, what did you think of the film? I hope this review was helpful to you. Once again thank you so much for reading my review, it is much appreciated!